One of the things that I have been able to share with others, especially seminarians and priests, is some valuable information about change and how to embrace it successfully. For several years, I taught a course at St. Meinrad Seminary on managing the transition seminarians go through when they leave seminary and enter priesthood. I even wrote a little book on the subject. In my last years at St. Meinrad Seminary, I developed a program for senior priests as they go through the transition from regular full time ministry into sometimes full time retirement ministry, called Encore Priests. Soon I will be able to announce my latest effort in that same area called The Catholic Second Wind Guild which will offer "retired" priests and lay persons exciting opportunities to offer their gifts and talents in the church of the Caribbean and maybe beyond. During my years of teaching about-to-be-ordained seminarians, I was lucky to be assisted many times by my friend, Karen Dahlem, who owns her own consulting business helping people make successful transition. If you need help in making a successful transition at any stage of life, check out what Karen has available in the way of help. You will find her both very personable and extremely helpful. "Take a small step in the right direction." Click on her website listed at the bottom and see what she has to offer. As a Certified Coach, I can help you design and create what you would truly love to experience in the four key areas of your life: career, time/money freedom, relationships, and health. I specialize in helping people who feel stuck and dissatisfied with their lives, so they can quickly get unstuck and build the life of their dreams. Both individual and group coaching are available. You do not need to be local; we will work together via phone and Skype. PASSING ON THE KNOTT GENES ... without me, of course! JOHN KNOTT (dates unknown) born in Yorkshire, England. CLEMENT KNOTT ((1784-1870) (Ann Nancy Hardesty) born in Maryland, moved to Washington County, Kentucky, moved to Breckenridge County, Kentucky. He was the first in the area from which my immediate family comes. He later moved to Perry County, Missouri, where he is buried. His son Raphael stayed behind. RAPHAEL KNOTT (1832-1914) (Abigail Basham) born in Marion County, Kentucky, died in Breckinridge County. FRANCIS MARION KNOTT (1865-1950) (Ida Hardesty) born in Breckinridge County, died in Louisville, buried in Meade County, Kentucky. He and Ida divorced, rare in those days, but she is buried in a separate grave several feet away as if they never knew each other. 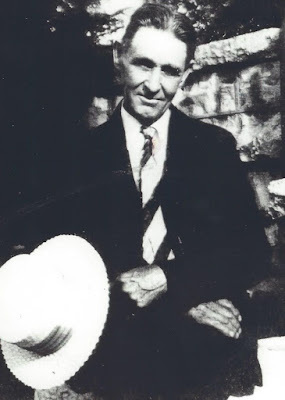 LEO FRANCIS KNOTT (1892-1973) (Lillie Mills) born in Meade County. Lillie delivered me! My great nephews, Wesley Jr and Cory, Knott came over for dinner recently. As I sat there looking at them. it amazed how much they look like my brother Gary and my grandfather and great grandfather and so unlike me, my brother Mark and my Dad. I look more like my father, my youngest brother, Mark, and one of my uncles, Lamar. 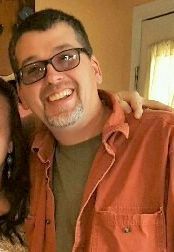 My uncle Bob (Robert) Knott and my nephew Mike (Michael) Knott, all have the same look and temperament - dark hair, laid back and relaxed. 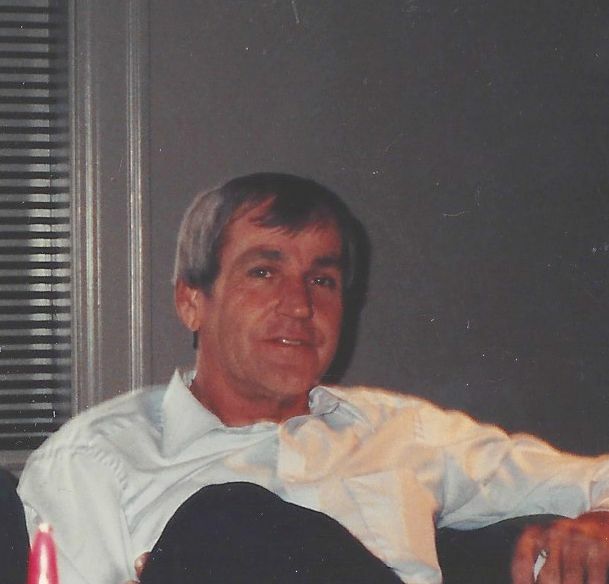 My Dad, myself and my brother Mark all have the same look and temperament - light hair, anxious and often frantic. 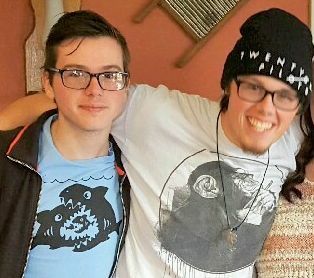 My great nephews, Wesley Jr. (right) and Cory Knott (left). Wesley has the high energy of myself and my brother Mark. Cory has the relaxed and calm demeanor of his father and great grandfather. great grandfather and great great grandfather (below). 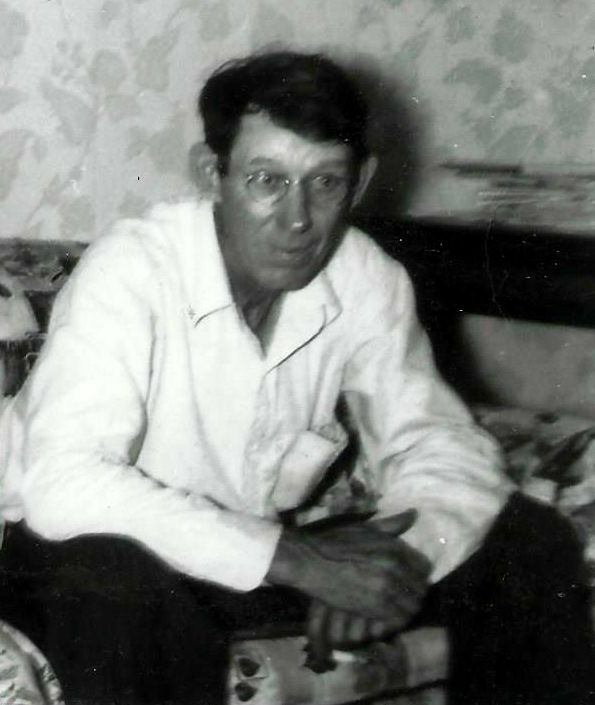 My grandfather, Leo (Francis) Knott, kept his black hair until he died in his nineties. The name "Francis" runs through the family tree, not only in Kentucky, but also in Maryland. Another interesting fact that runs through family history is that so many of the family members were, and still are, involved in the construction and lumber businesses. My great grandfather's hobby was wood working. My grandfather owned a saw mill. My father had a sawmill in my very early years, but in later years started a successful building material business. My youngest brother Mark took over, and has greatly expanded, my father's building material business. Several Knotts in Maryland and Oregon, even today, are in the construction business. Last year, I ran into some Knotts in Newfoundland, Canada, who were operating a construction company. One of the things that I always noticed as a child, working in my father's building material business, was the fact that people rejected lumber that had a "knot" in it! "I'm not taking that! It has a knot in it!" I took it personally! Coming across this old photo recently, I was reminded of my first real moral dilemma. 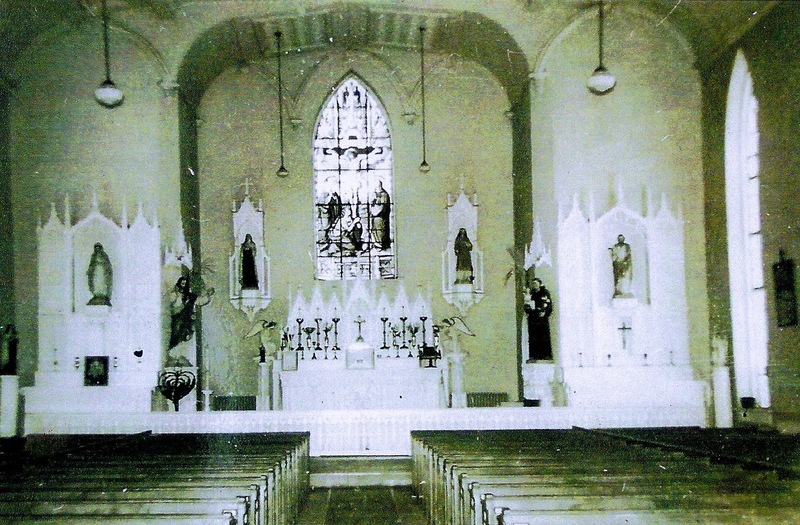 Look closely at this old interior shot of St. Theresa Church! At the foot of the Mary statue and under the Sacred Heart statue is a heart-shaped votive stand - a place where people could drop coins, light a candle and pray for a special intention. I could not afford a candle, so I never used it. I had to pray without the help of a candle. Maybe that is why so few of my childhood prayers were answered? I digress! About 1953, this old votive stand was thrown into the dump behind the church. I guess it was too far gone to repair. The dump was a great place for my brother, Gary, and I to go "treasure hunting." I was 9 years old and he was 8. One day we came across this discarded votive candle stand. I had a big stick in my hand so I gave it a big whack. All of a sudden, coins started flowing out of it like some kind of heavenly slot machine. There was so many coins in it that it didn't rattle when it was thrown out, so nobody bothered to check its contents. After a day obsessing over it, and knowing we would get caught if people saw us spending a lot of suspicious cash in that small town, we decided that we would take our chances and take it to Father Johnson in hopes that he would let us keep it. Bad idea! He gave us a quarter each and sent us home! Childhood lesson learned! Crime may not pay, but sometimes honesty doesn't pay much either! My brother Gary at a slightly earlier age - about four. Me at a slightly earlier age - about five years old. I am the altar boy on the right at this Latin Mass wedding at 7 or 8 years old. The old votive stand might, or might not, be in this picture, on the left, but out of sight. It was about this time that it was removed and dumped. President Joseph J. McGowan, Jr.
as a Bellarmine University Chaplain! (2) By listening in on the conversation between Jesus, Martha and Mary, we are taught also about God’s willingness to give us new life. This eternal life is on both sides of death. Death does not have the last word. Eternal life is not just some promise for the future; it is available to us right now. We are in it, as we speak! Through Jesus and in Jesus, those of us who are “dead on our feet” can be resurrected now. We can be born again. For that very reason, I am naming the new program for retired priests and professional lay people that I hope to announce soon, publicly, "Catholic Second Wind Guild." It is for those of us who believe we can have "another life" in our senior years. I believe that we can act boldly on our own behalf to live purposeful lives, to help others, and to claim the powers that lie dormant within us. One of my favorite old movies is Harold and Maude. This is Maude’s message to Harold throughout the movie: “Oh, how the world dearly loves a cage! There are a lot of people who enjoy being dead.” Jesus came, not just to bring a wonderful life after we are dead, but right now!